The durian season is here again, as the main fruiting season occurs from June to August – which means the durians you get now are more ‘fragrant’ and yummy. Fragrance for durian is really subjective. As what Anthony Bourdain says, you either love or despite it, and your breath will smell as if you’d been French-kissing your dead grandmother. I hope nobody has ever done that. 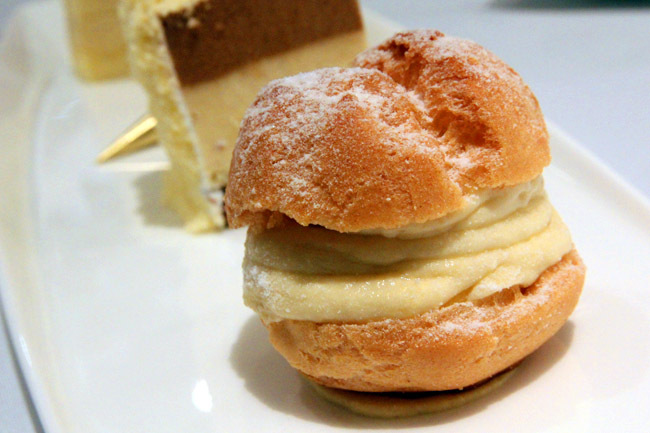 Talking about durians, the best place to get your durian puffs and desserts has to be Coffee Lounge at Goodwood Park Hotel. 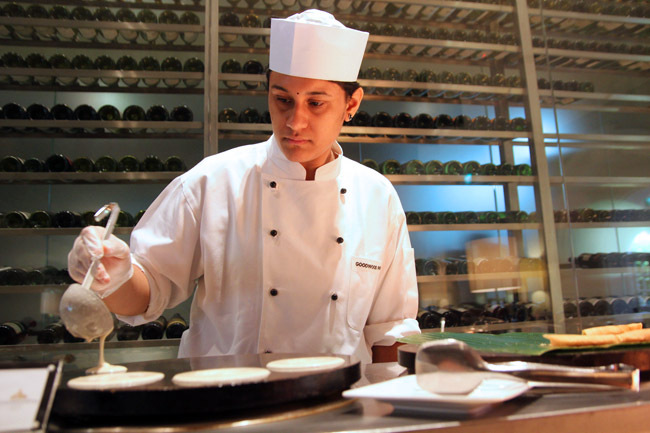 Apart from the signature Durian Puffs and legendary Durian Mousse Cake, there are also all time favourites such as the Durian Crepe, Durian Strudel and Durian Cappuccino Cake. 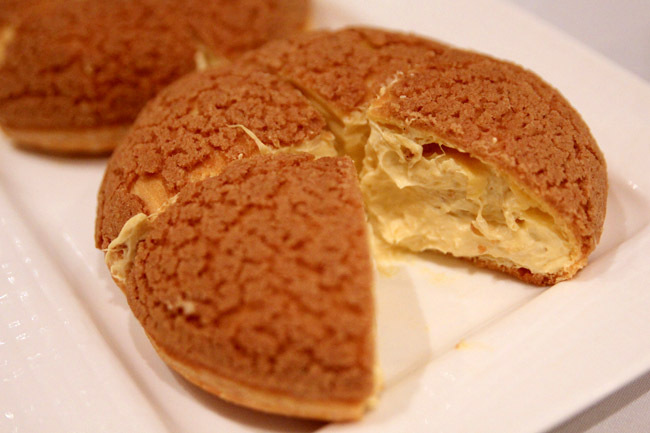 Number 1: “Mao Shan” Power Puff ($16.80+ per piece) comes in a shape of a powerful flying saucer, with creamy pulp in a mega choux pastry. This is crazy rich, and after having a quarter, the other durian puffs pales in intensity. Beware, this is limited stuff only for the month of June sold from noon to 7pm. Number 2: Durian Puff ($6 for 2 pieces). I am sure this is the number 1 seller, looking like a profiterole with light mousse-y durian flesh. I like it that it is dainty, and fits into one mouthful. 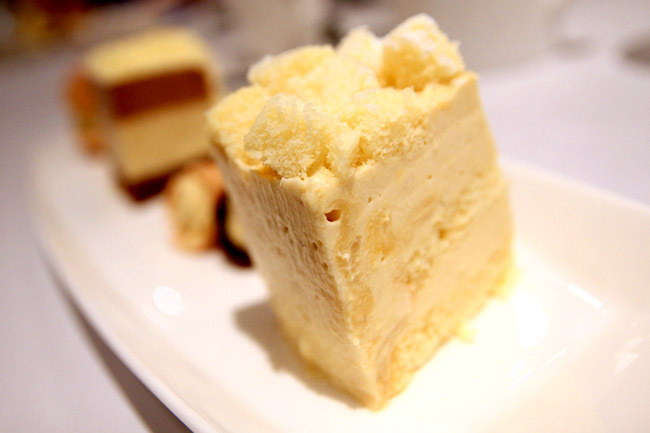 Number 3: Durian Mousse Cake ($10.80 per slice). This star which kicked off their famous promotion in 1983 stood the test of time. The slice is velvety, yet not incredibly heavy. Number 4: Durian Cones. 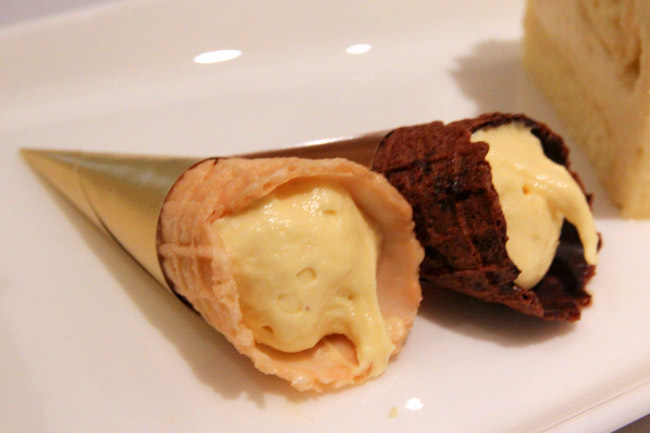 The pair of mini chocolate and vanilla waffle cones filled with durian mousse delighted almost every girl in the table. So cute and petite. I never imaged anyone using ‘petite’ to describe a durian dessert. I was just okay with this, and wondered how it would be if it comes in an actual cone size. 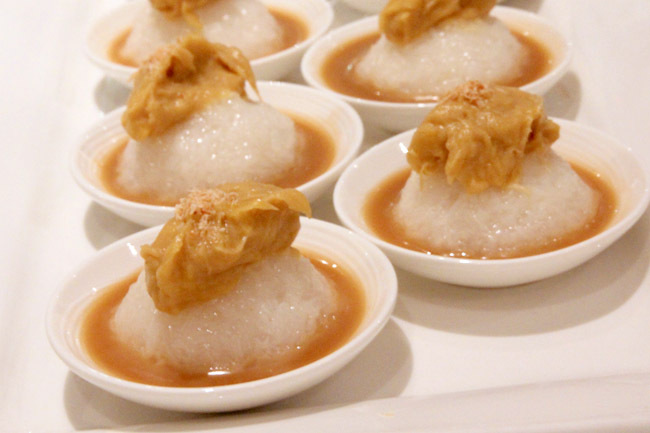 Number 5: Durian ‘Pengat’ with Glutinous Rice and Gula Melaka only tastes good with the gula melaka sauce. On its own, the rice is too dry and ordinary. This is only available at the dessert buffet. Some of the durian pastries are served in addition to the regular dessert buffet at the Coffee Lounge, $32.80++ with dessert only, $26.80++ additional top up with main course order, and $48.80++ with Taiwan Porridge buffet. Warning though, bringing mints may not be enough, a toothbrush and paste is necessary for the attack of the durians.